Once you click submit, we'll send you an email asking you to confirm your registration. We'll then provide you with the download link for this special report. By submitting this form, you understand that you will also be subscribed to the NaturalNews email newsletter. Your privacy is assured and your information is kept confidential. You may unsubscribe at anytime. Why the FDA, CDC and even the natural products industry doesn't want you to learn this information. Why conventional medicines and vaccines will utterly fail in a pandemic. The top five anti-viral remedies recommended by the Health Ranger. 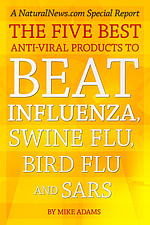 Exact links where you can acquire most of these recommended anti-viral products right now. Four additional natural remedies offering powerful anti-viral properties. How health authorities try to dumb down the people to turn them into victims instead of self-reliant citizens. The real reason why plants offer such powerful anti-viral medicine.